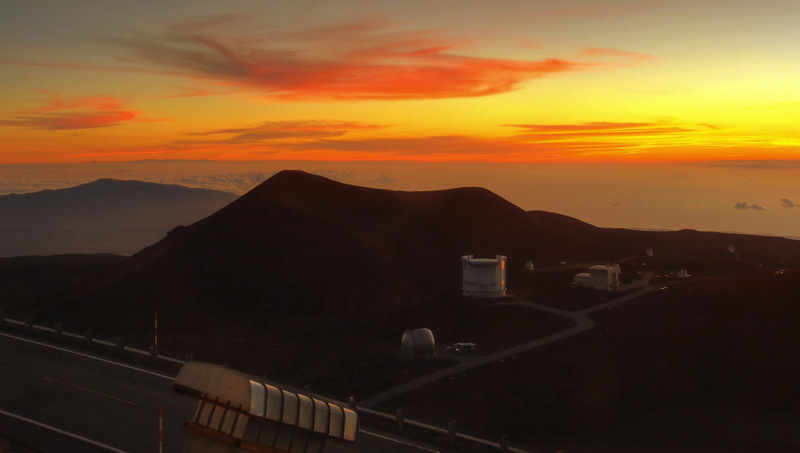 It's still a few minutes before sunrise, but the shadow of our planet, Earth, can be see in the western sky above the Subaru telescope. Bet you thought I was going to talk astrophysics for a change! Sorry. 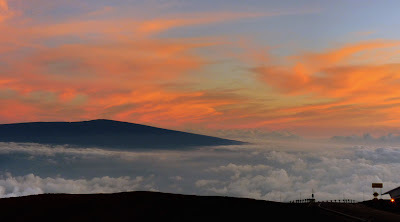 Below is a picture I took the other day of Submillimeter Valley near the summit of Mauna Kea at dawn. There's the CSO down to the left along with our emergency evacuation vehicle in case we have a serious medical case at the summit. In the middle is the JCMT and to the right are the dishes of the SMA and the hangar where we keep the alien spacecraft we shot down overnight. Just for a bit of fun, I sent the picture to TiltShift maker. I tried it before with a picture of Santa Barabara but haven't tried it with summit pictures before. The whole idea is to put most of the picture so out of focus it makes the whole thing look like a toy model. I prefer the Santa Barbara picture but this isn't too bad! Click on the pictures for larger versions as ever. A recent observer surprised me the other day when he walked back into the control room before the sun had officially set. I had told him to go out and enjoy the sunset. I do this for all the observers I support. They may be summit novices or Mauna Kea veterans but they don't have the same opportunity as I do to watch sunsets (or sunrises) from 14,000 feet. This time of day often involves taking calibration data but I also want our guests to experience a sight most people will never see in their life and I'm happy to take over the start-of-night work while they enjoy the view. Of course, what had happened is the sun had "set" behind the clouds but wasn't actually below the true horizon. 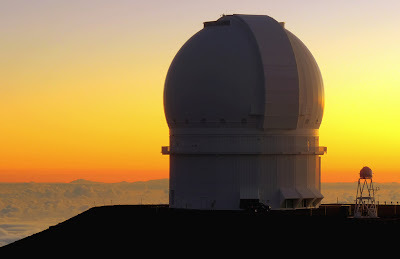 Some visitors to the summit are confused by "official" sunset times. Many media publish the times of sunset and sunrise but it's often calculated for sea level. 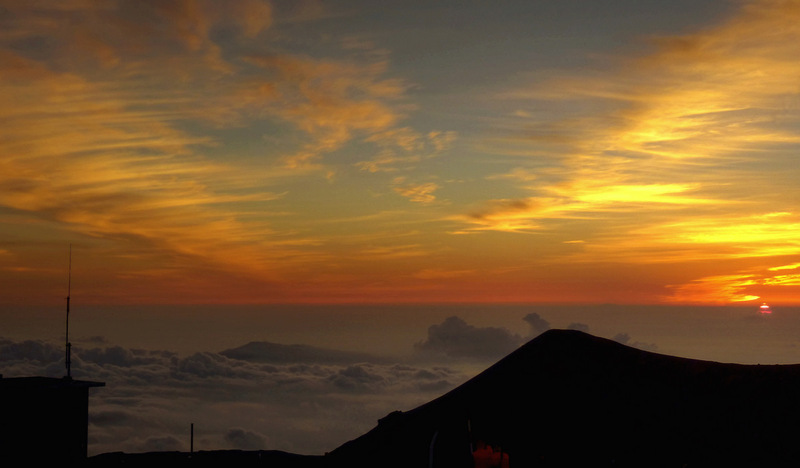 Because we're so high, the sunset actually occurs several minutes after it does at sea level. This isn't too much of a problem for most as they've already arrived and are ready, but conversely sunrise occurs several minutes before those at sea level experience it, so if you're not prepared, you'll miss it! 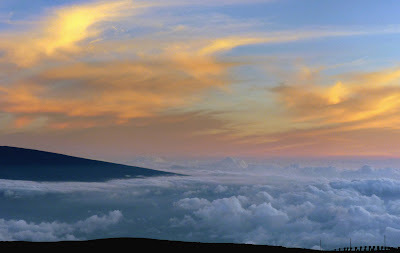 For example, this evening the sun set in Hilo at 6:59pm but at the summit sunset was at 7:10pm. 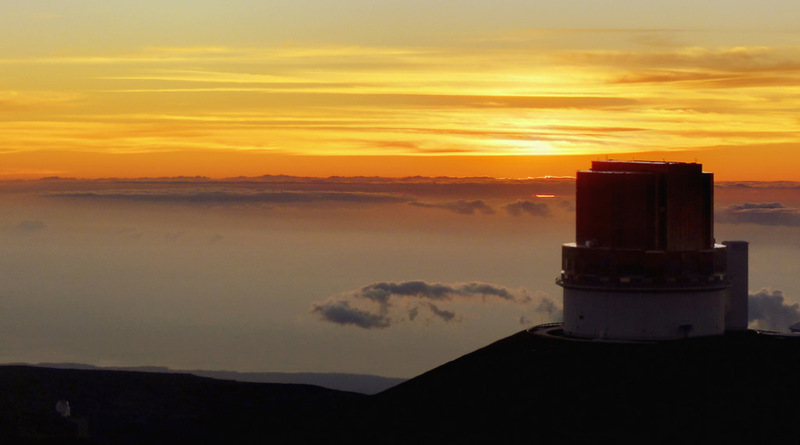 Sunrise tomorrow morning occurs at 5:47am from Mauna Kea but from Hilo it'll be 5:55am. This may seem an insignificant difference to many, but knowing the exact time of sunrise and sunset is crucial to us as we rely on those times to start calibrations. A minute or two wrong either way can mean the data are useless, so it's something we need to make sure we get right. It's not actually one of the islands of Hawai`i, it's one of the several volcanic peaks on the Big Island of Hawai`i. The view from Mauna Kea's summit, however, tends to make it look a little like an island in an ocean of clouds. I'm not sure I'll have many more opportunities to be at the summit at sunrise and it's not as if I've taken too many photos of sunrises there in the past. It's possibly the most beautiful and serene time on the summit: it's quiet, there are few tourists and the light is stunning. On the other hand, it's the end of a very long night shift (close to 14 hours on a clear winter's night) and it takes a little time to get things set up properly to take nice photos on the summit. We run a "buddy system" (as do most observatories) so we're always accompanied by someone else in case of problems, and the last thing I want to do is hold them up when all they want to do is return to lower altitudes for some sleep. So, the photos are taken quickly. Above, the CFHT is closing at sunrise. 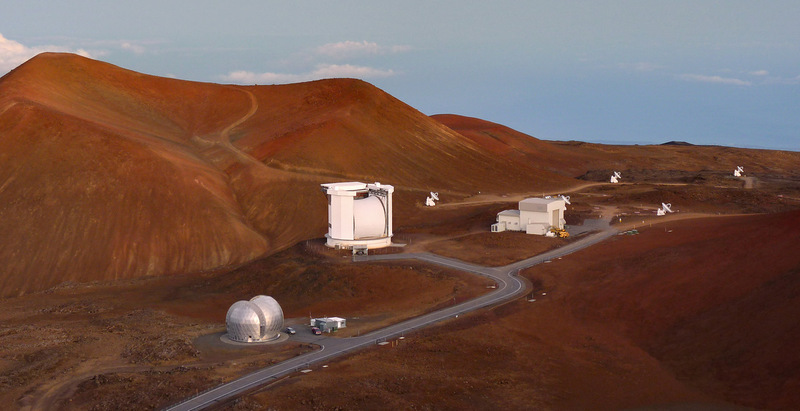 Like us, the CFHT is planning to switch to remote operations, that is it'll be run remotely without anyone actually at the telescope. I'm hoping to swap some notes as we'll both be starting this new operational mode at roughly the same time. 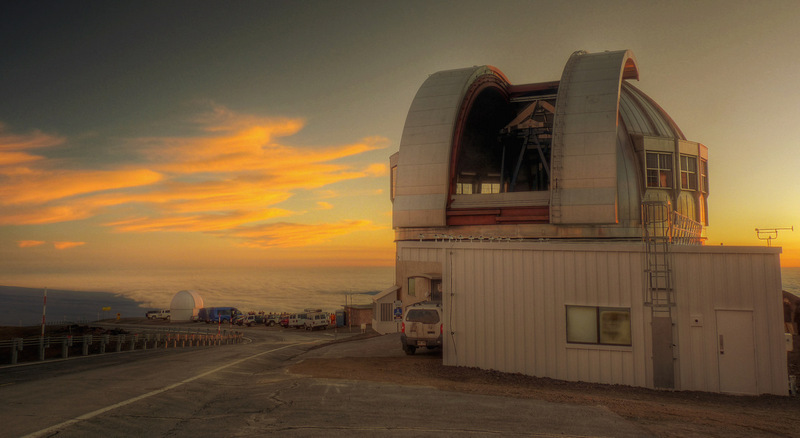 Down below, in Submillimeter Valley, the CSO is closing while the JCMT continues to observe despite almost daylight conditions. 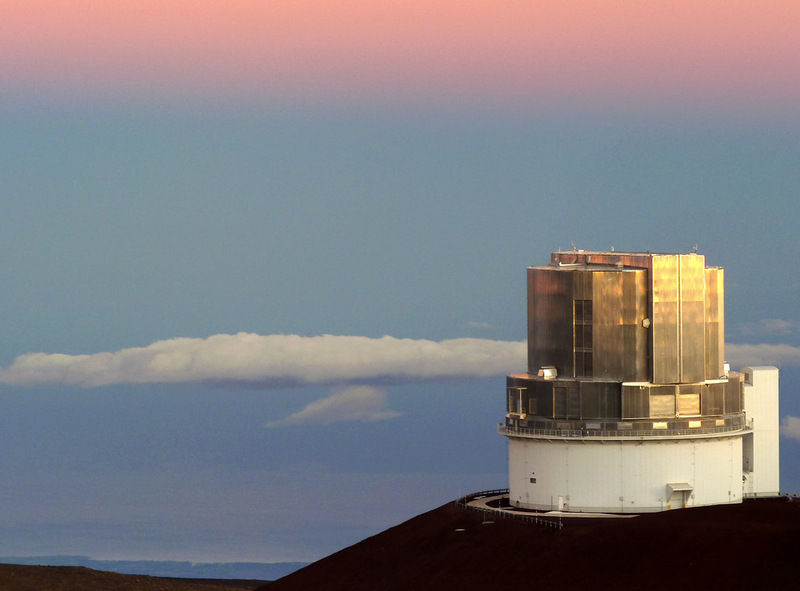 These telescopes can operate during daylight if necessary and it's only money, staff effort and a build up of water in the atmosphere during the day that prevents this. 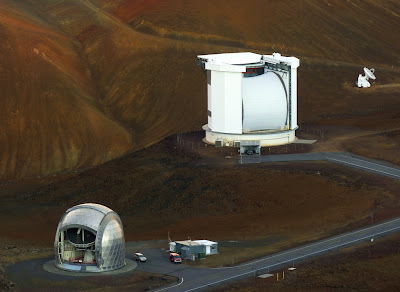 In fact, UKIRT and the IRTF can also observe in daylight although the bright sky does provide the odd problem or two. In fact, some years ago, I helped commission an extremely complicated mid-infrared instrument, Michelle, by starting the day at 2am with a drive to the summit, observing from roughly 6am to 10am each morning, driving back down, doing office work, returning home and trying to go to bed at 8pm each evening. The plan worked but unfortunately I was a complete psychological wreck for several weeks! The IRTF, above, is often open in daylight hours although on this occasion they closed at sunrise. They're often open when we arrive at the summit in the early evening because they're observing a planet in collaboration with NASA spacecraft or work well beyond dawn for the same reason. Finally, it's time to head down. The JCMT remains open, the CSO is closed and it's impossible to tell if the SMA is still working as they don't have domes to close. 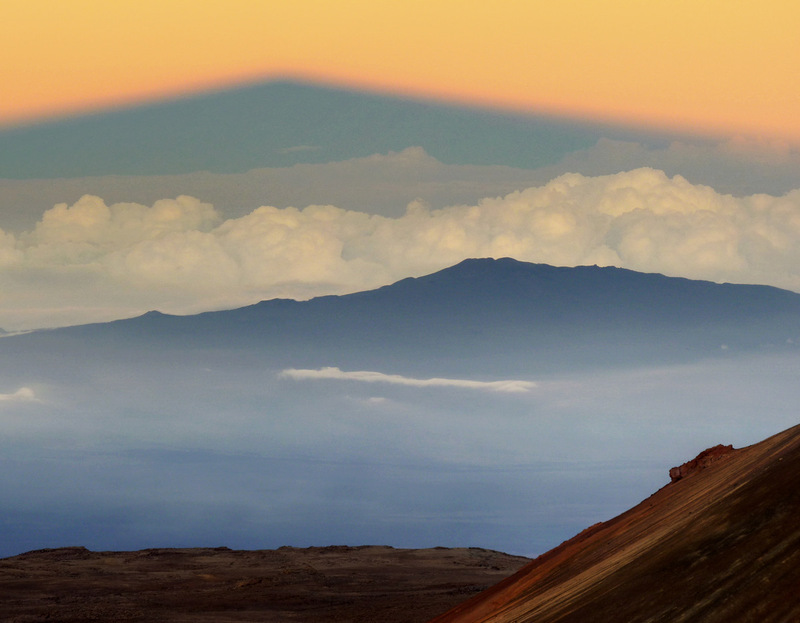 The shadow of Mauna Kea is shrinking by the minute as the sun rises and will soon be gone. I'm hoping for one more chance for sunrise photography at the summit before we switch to remote observing. Although I'll still visit the summit on occasions it won't be anything like the current frequency. It's almost as if a part of my life will disappear! "This is an update on the Hwy 19 road closure near the 28 mile maker. Although the roadway has been cleared, air quality remains at unsafe levels for public access. Crews are working to mitigate the issue. Kaawalii Gulch continues to remains closed until further notice. Thank you for your patients. This is your Hawaii County Civil Defense." Given this is the USA I'm sure the hospitals will welcome fee-paying patients and those stuck on the highway will just have to exhibit a little patience. In the meantime, here's another sunrise shadow picture. It's the end of the night shift for us on the mountain. After a long night spent trying to satisfy our scientific curiosity it's time to shut down the telescopes and drive down to Hale Pohaku for some much needed sleep. I don't usually take pictures at dawn, I'm usually too tired and all I can think of is breakfast and trying to get some sleep down below. Despite being so tired, I know sleep at 9,000 feet will be fitful and like nearly everyone else I've spoken to who has slept at HP, my dreams will be bizarre and sometimes quite disturbing. It's one of the strange effects of sleeping at altitude that none of the observatory websites tell you about! The sun is still below the horizon and the Gemini telescope is still open and trying to get the last photons from the Universe for the night. 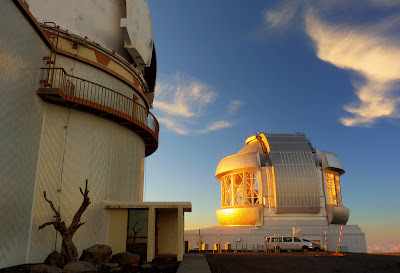 The CFHT has closed, the sky is now too bright to be able to work and the staff inside the dome are doing their end-of-night shutdown procedures. 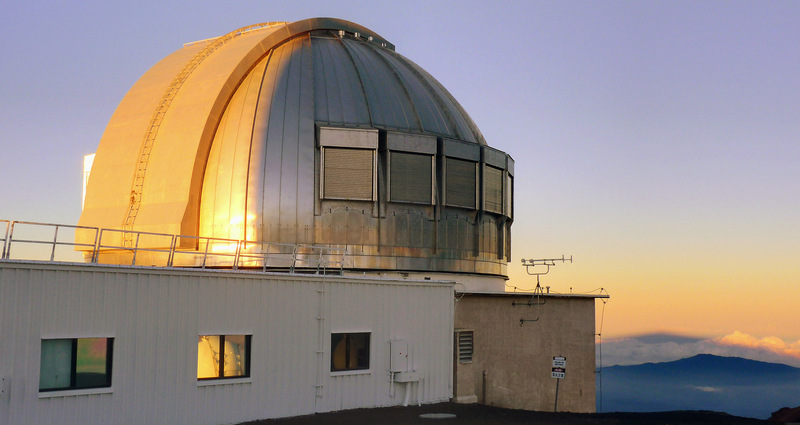 Keck 2 is shutting down and making sure the dome is closed before sunrise. And twenty minutes later the observing staff are off down to lower altitudes and breakfast! On the other hand, Subaru stayed closed all night. 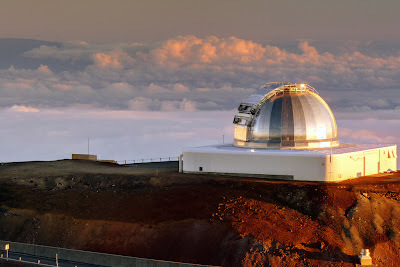 The telescope is undergoing some heavy engineering and I believe it'll remain closed until some time in September. It's very noticeable that HP has become a much quieter place at dinner these days! 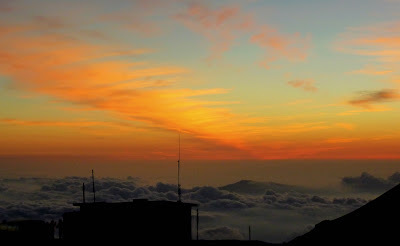 As ever, click on the pictures for larger versions and I have some more sunrise pictures from the mountain to come. It's around 5:30 in the morning and it's time to take some calibrations. 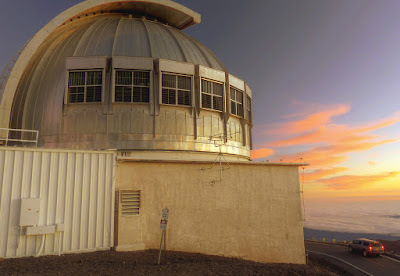 Non-astronomers/scientists reading this probably have no idea what I'm talking about or what the title of this post means! In the old days astronomers used to take pictures of the night sky using film or photographic plates. As an undergraduate I remember taking several pictures using glass plates and then developing them in a dark room only to find my mistakes when it was too late! These days just about every professional astronomical observatory uses electronic detectors instead of film. Optical telescopes use CCDs (similar to those in your digital camera) and us infrared stalwarts use infrared arrays, although essentially the physics is the same. The detectors convert photons into electrons which are then used to create a picture. Although not such a big problem with optical CCDs, infrared arrays tend to have noticeable differences in the efficiencies and gains of each pixel on the array. In our case, we use four 2048x2048 pixel arrays (that's nearly 17 million pixels) all of which have slightly different responses to light. 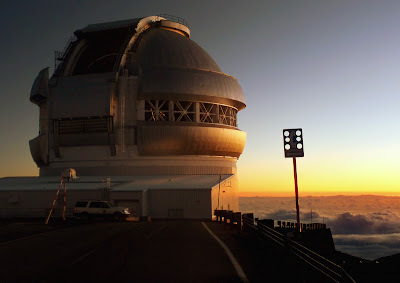 Unless the detectors are calibrated the result of looking at a nice uniform piece of night sky would result in varying brightnesses across the final images and not a real representation of what we're looking at. To correct for that we take flatfields; the arrays are exposed to a uniform light source and the pixel-to-pixel variation can be mapped and corrected for. 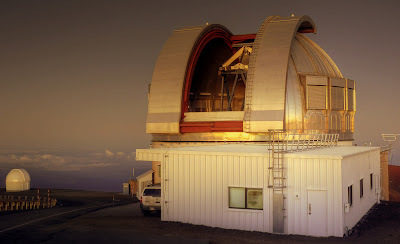 In many of the instruments I've worked on before this is done using a light source within the instrument, but this can't be done with WFCAM or indeed most imaging instruments, so the bright twilight sky is used instead. Taking these flats is not a favourite task for our staff at the telescope or the observer. At the end of a long night (12-13 hours in the winter) all you want to do is get down to a lower altitude, have a little breakfast and go to bed, but these calibration data are essential. We've tried using the sunset sky as a flatfield but the results haven't been good, probably due to instabilities caused by a warm dome which is quickly cooling down at the start of a night although I'll admit I really don't understand why this should affect flatfields. Just before sunrise, however, everything is in thermal equilibrium and so this is the time to take the calibration data. It doesn't take too long - 15 minutes or so at worst - and we make sure this is only done a few nights per month just to keep our staff sane! 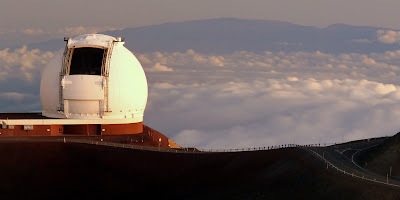 At 6am the sun is up, the dome is safely closed and the observers are probably just arriving at Vacation Resort Hale Pohaku (HP) for breakfast. 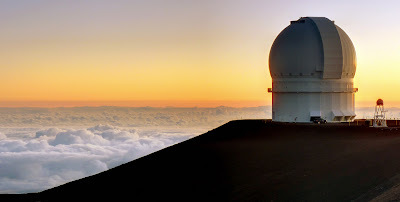 It's a very quiet time at the summit because all the astronomers have left and apart from a very small number of tourists and a ranger, I'm the only one up there watching the shadow of the mountain slowly sink behind Hualalai. Oh, enough of this nonsense, it's time to head down for bacon and eggs at HP! 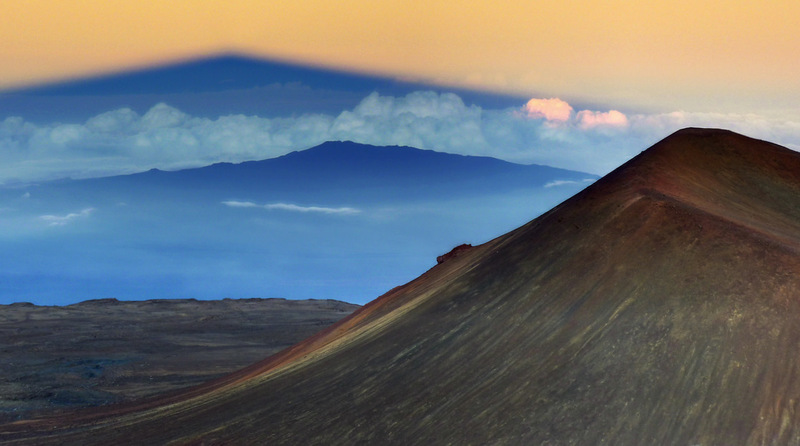 Sunrise this morning: Mauna Kea's shadow looms over Hualalai with Pu`u Poli`ahu near Mauna Kea's summit in the foreground. It's a busy night of telescope engineering tonight. There was only time to pop outside for a few minutes. As usual there was an enormous crowd out to watch the sunset from the summit of Mauna Kea. A quarter moon was high above us and I managed to get a shot of it and UKIRT before heading back inside to start the night shift. I don't get it. Anyone care to explain? This should be the last of the cloud pictures for now as once again I've run out of photos. I do have one or more California pictures to process from the trip months ago but they're not particularly spectacular. I was hoping to take up a new hobby of photographing some of the island this past weekend but was struck down by a bug so spent the weekend and the last day or two in bed or at least not having much energy to travel far from the bedroom. I grew up in a place called Bracknell which is in Berkshire, England, and for decades the town was important because the UK's meteorological office (met office) was based there. My father worked there although he was placed at Beaufort Park, a beautiful place a little outside Bracknell, which was an experimental site for the met office and the Ministry of Defense (who then ran the met office - they may still do, I'm unsure). Because the met office was a major employer in the town many of my neighbours also worked there. I still remember receiving a book from our next door neighbour on cloud recognition. It must have been my 9th or 10th birthday, I don't remember now, but it was a wonderful gift! Unfortunately I no longer have the book but I still remember the pictures and remember asking my father to test my cloud recognition on those long summer evenings at home. I'm sure the last thing he wanted to do was talk meteorology again after a long day at work, but he did and it's what got me into science. It was a wonderful time and I wish he was still around so I could say thank you! The met office is no longer in Bracknell, I believe it moved to Exeter in south-west England, and my father is also no longer around, but I think something has stuck in my mind from those times over thirty years ago. I still love the beauty of clouds! By the way, the same neighbour gave me my first astronomy book a couple of years earlier. Anyway, these were pictures taken in March this year and versions of them appeared in this blog then, but there were several pictures I didn't process so here are one or two new ones from that evening. Please click on the pictures for larger versions as usual. Oh, you want me to name the cloud types? I hope you enjoy these pictures of beautiful Hawaiian clouds! They're all from the summit of Mauna Kea, the first two are looking south towards Mauna Loa and the third looks north-west with the NASA IRTF telescope and Haleakala on Maui in the picture. The pictures look better if you click on them. If you can't read the words, click on the picture as you'll see a larger version. Only one bit of this has recently become out of date. Can you spot it? I hope to change those few words in the near future. We had a clear view of the ocean while the sun was still a few degrees above the horizon. That's why there's so much lense flare, I'm almost pointing directly at a very bright sun. The messing about with photomatix resulted in showing up the vog really well though. All that crud to the left isn't low cloud, it's noxious stuff spewed out by Kilauea and sent to the leeward side by the trade winds. I apologise to those on the west side of the island for having to deal with a volcano on the eastern side, but there's little we can do about it! A few minutes later, you wouldn't have any clue that the vog is a problem, it can't be seen anymore. Click on the pictures if you want to see larger versions. 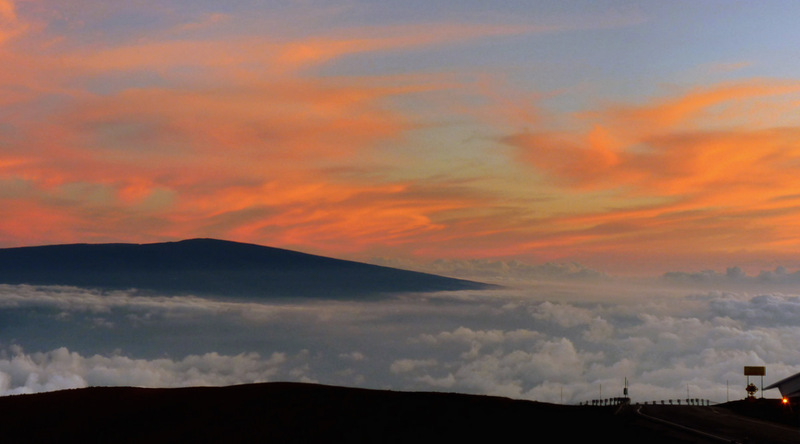 Hualalai surrounded by a sea of clouds at sunset. Many of the observatories on Mauna Kea open their domes before the sun has set. It's not because they're observing anything, it's to help equalize the temperature within the dome to that of the outside air. Having said that, many observatories can observe during the day, especially those that operate in the mid-infrared (beyond about a wavelength of 2.5 microns) and the submillimetre (such as the JCMT and CSO). Many years ago we started the commissioning process of an instrument called Michelle by observing after the night shift had ended until around nine or ten in the morning. After that the sun is high in the sky and the risk of the primary mirror concentrating sunlight on part of the dome becomes a real risk. Even before then we would regularly go out into the dome to make sure we weren't setting fire to the observatory! Those were long and tiring shifts, I remember them well. During the day heat builds up inside the domes. 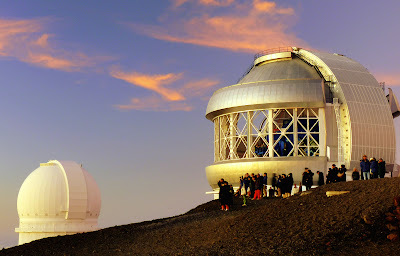 Some observatories actively control the dome temperature via air conditioning whereas we (UKIRT) control the primary mirror temperature to keep it as cold as the expected night-time air. This is a project we've been doing for a couple of years now and it's made a significant improvement to the delivered image quality in the first few hours of the night. No matter how these things are handled though, it's always best to try and ventilate the dome for as long as you can before observing starts as any difference in the temperatures inside the dome and the outside air result in local turbulence and reduced image quality. Gemini, one of the observatories that employs active cooling of the dome, will still open the vents early when they can, as seen above. 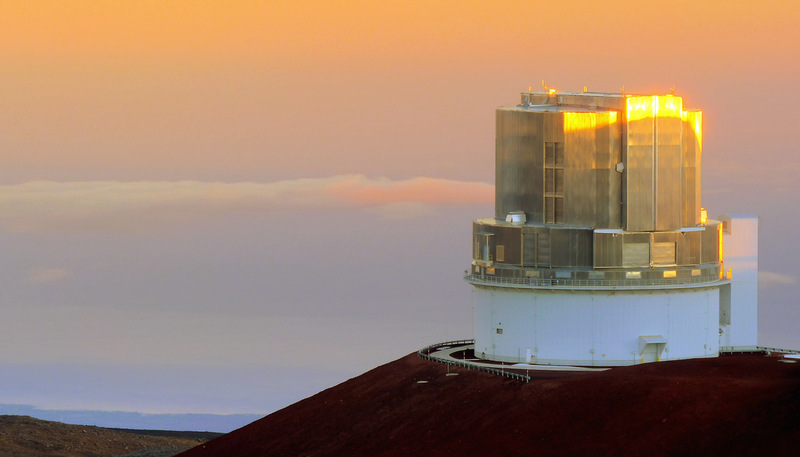 I think the only issue I'd have with this is that sunlight is apparently being allowed to strike the telescope structure directly. Our own experience with this is that it's enough to heat the structure so that thermal expansion occurs. It's only a few microns but it makes a difference. On the other hand, Gemini is a much larger telescope and therefore has a much larger thermal mass than us, so it may not be a problem. 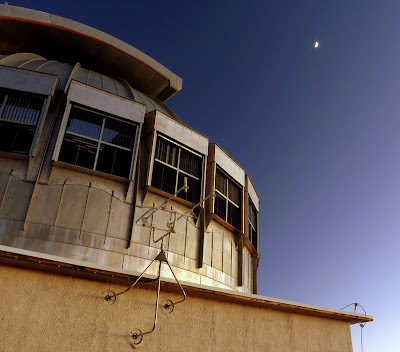 At UKIRT we open the dome ventilation system as soon as the night crew are at the summit although the vents facing the setting sun remain closed. The dome slit is opened as well to help with the cooling process although we make sure the slit is facing away from the sun! We rely on the summit winds to blow through the dome and equalize the temperatures although that's a bit of a problem when it's calm. Fortunately, that's doesn't happen very often. This is also the time that the summit tourists find their best spots to view the western sky for a sunset of a lifetime. 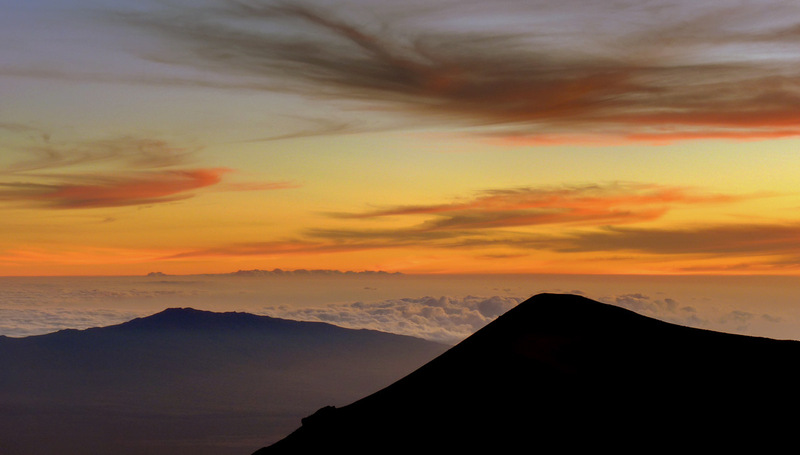 I tend to join them when I'm on the summit because no matter how many times I've watched a Mauna Kea sunset, they simply never become boring. The sun has just disappeared below the horizon and all around me people have witnessed a sight they'll probably only see once in a lifetime. 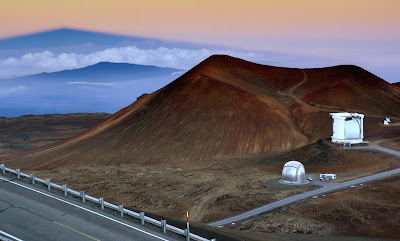 You might think those of us that work on Mauna Kea's summit would be bored of the sight by now, but that isn't the case. 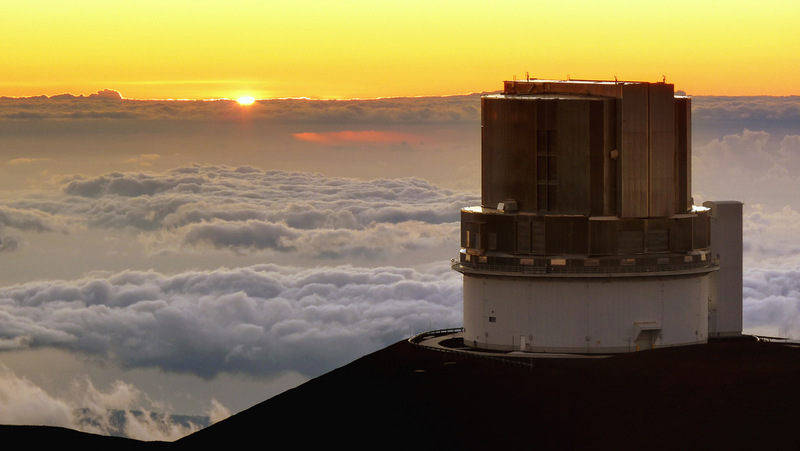 If you take a close look at the picture above, Gemini staff and observers are standing on the telescope mount watching the view from within the dome. For both regulars and first-time visitors, the view is not to be missed. Outside the telescope dozens of tourists watch the spectacle. They are just a small subset of people watching the spectacular view; about a hundred yards behind me are approximately three times this number enjoying the moment. At around $200 per person for taking the tour to 14,000 feet, I hope they are satisfied! The visitors will be heading back to sea level soon. 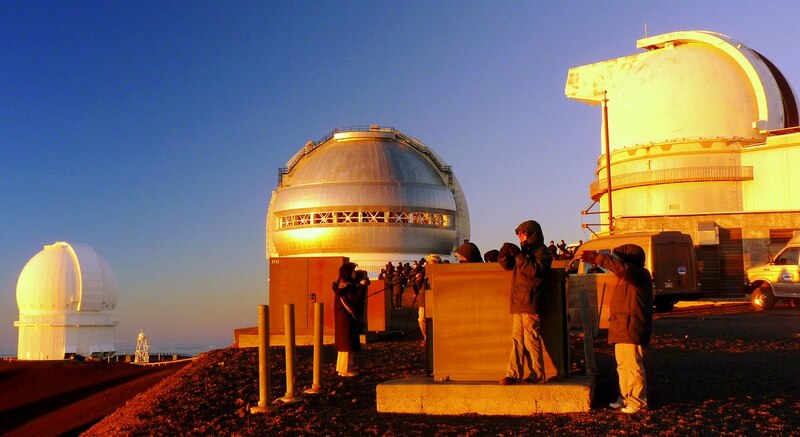 They'll stop on the way down to view the night sky from one of the best astronomy sites on the planet and then return to their hotel rooms a little before midnight. As they leave the summit, my workday begins. 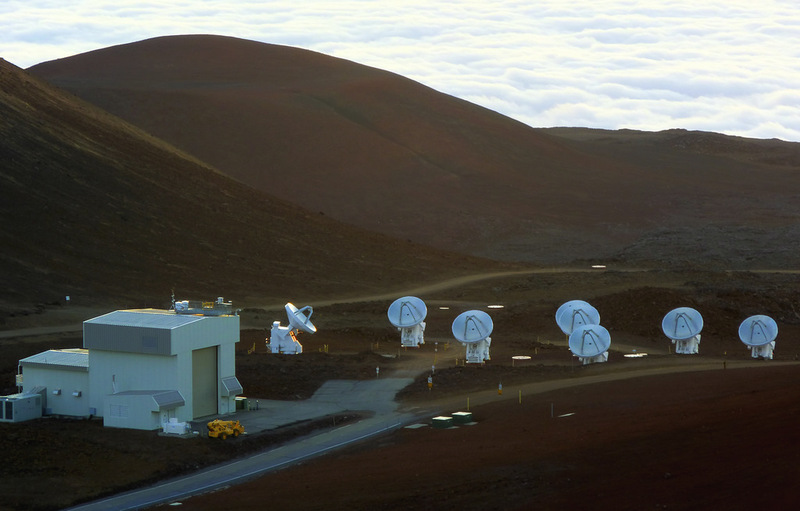 The Smithsonian Submillimeter Array (SMA) appears to have deployed its dishes to their maximum extent. A few weeks ago I posted a picture in "Odd one out" where you can see them about as closely grouped as they can get, with the "sergeant major" to the left (see picture below). Now they're as far apart as I think they can get, obviously trying to maximise their delivered resolution at the expensive of sensitivity. I wonder what they're observing? At this time of year the Galactic plane is roughly overhead at around midnight, so at sunset it'll be very low on the eastern horizon which is where the dishes are pointing. Maybe they're studying our Galactic centre? It's one of the hottest topics in Galactic astronomy these days. The last couple of nights have offered some of the more spectacular sunsets from Mauna Kea's summit. I've a few more photos to come! 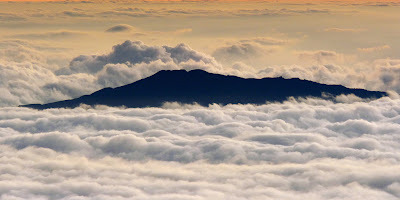 Above: distant Hualalai to the left, Pu`u Poli`ahu to the right, the usual ocean of low-level clouds beyond the peaks and beautiful post-sunset clouds above. Layers of vog are noticeable below Hualalai's summit. Don't forget that as ever you can see a much larger version of the picture by clicking on it. 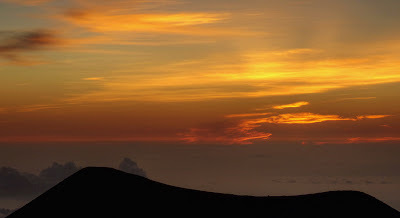 About half an hour before sunset the Kohala coastline 14,000 feet below is clear and the sunlight reflects off the Pacific ocean. Distant clouds on the horizon are a worry for tonight, but so far they haven't bothered us. 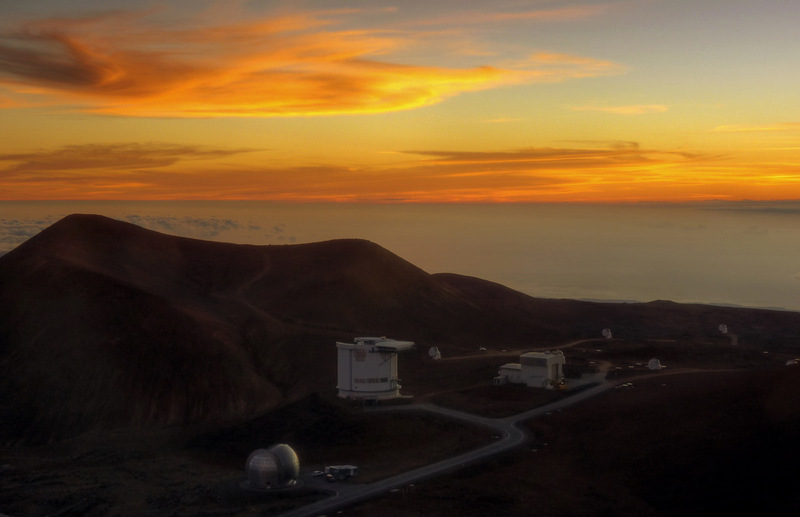 Well after sunset, Hualalai to the left, Pu`u Poli`ahu in the centre, Submillimeter Valley centre-right and red cirrus clouds above!